“He was special as a pup,” recalls George Attla. “Lingo, even when he was little, he always had to be in the front.” George’s approach to early training was to let him do anything he wanted. Born in 1979, Lingo’s only real flaw was a tendency to leap off the trail and roll in the snow to cool off. As a 55-pound adult with long legs and a buff-white coat, Lingo was George Attla’s greatest leader. Lingo had an extraordinarily powerful way to stretch out a team. 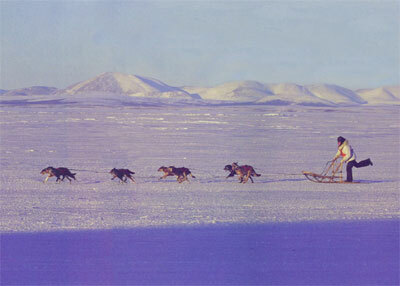 A 1982 Fur Rendezvous World Sled Dog Championship record-setting win marked Lingo as a world-class leader. As he got older he knew all the racetracks. He knew his limits. In the most difficult last 30-mile heat of the Open North American World Sled Dog Championship, George says not once did Lingo come up short. Read more about Lingo in article in March/April 1999 issue of Mushing Magazine. 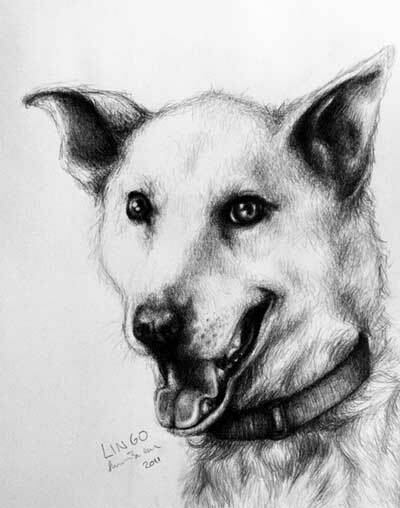 See a pen & ink drawing of Lingo that captured his spirit by Shawna Zusi-Cobb.